I love to read and study traditional furniture and woodworking techniques. As a result, I have a pretty good collection of books, my library card gets a good workout, and I have seen my fair share of videos. I am also an avid reader/viewer of most of the woodworking magazines, blogs and podcasts out there, and I spend plenty of time browsing the popular messageboards. So you would think that when a newcomer asks me for a recommendation on good books and/or videos to get for learning woodworking with hand tools that I’d have a huge list of recommendations for them. In fact, I do have a few recommendations, but they may not be what you might expect, and they really aren’t what I want to talk about today. That’s because I don’t think that putting in a lot of time reading and watching videos, at the expense of actual woodworking, is going to help you. You see, one of the challenges with learning to use hand tools is sorting through all of the different techniques. Frank Klausz cuts his dovetails by sawing the pins first. Roy Underhill cuts the tails first. Who’s right? What about chopping mortises? Should you start in the middle, or should you start at the end? Should you bore first and then clean up the waste with a bench chisel, or just go straight at it with a heavy mortise chisel? What’s the best way to sharpen? 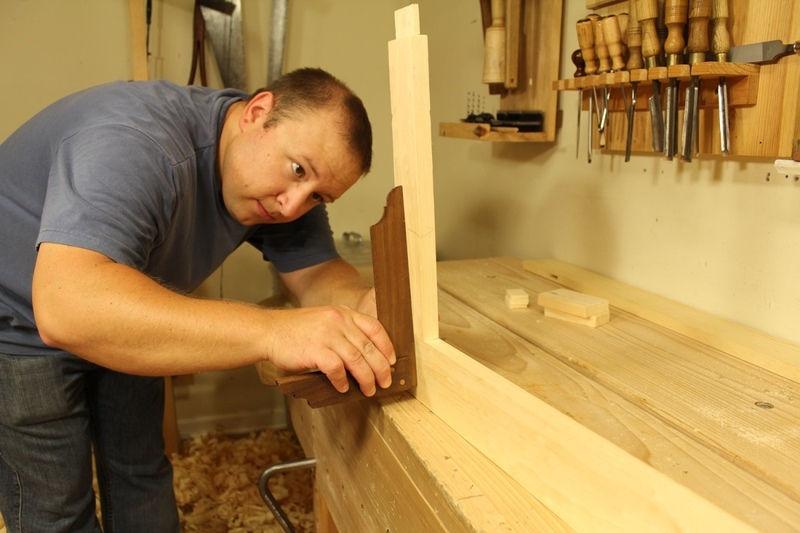 The up side to using hand tools is that there are so many different ways to accomplish a task. However, the down side to using hand tools is also that there are so many different ways to accomplish a task. With all of these different approaches available, it’s no wonder so many folks new to traditional woodworking feel so overwhelmed. Trying to learn all of the different techniques and approaches all at once will make your head spin clean off your neck. So it’s important when learning to incorporate more hand work into your projects to not let the information overload stop you from getting some actual woodworking done. It’s far too easy to get caught up in theory and forget that the original intent was to actually build something with all of these tools. 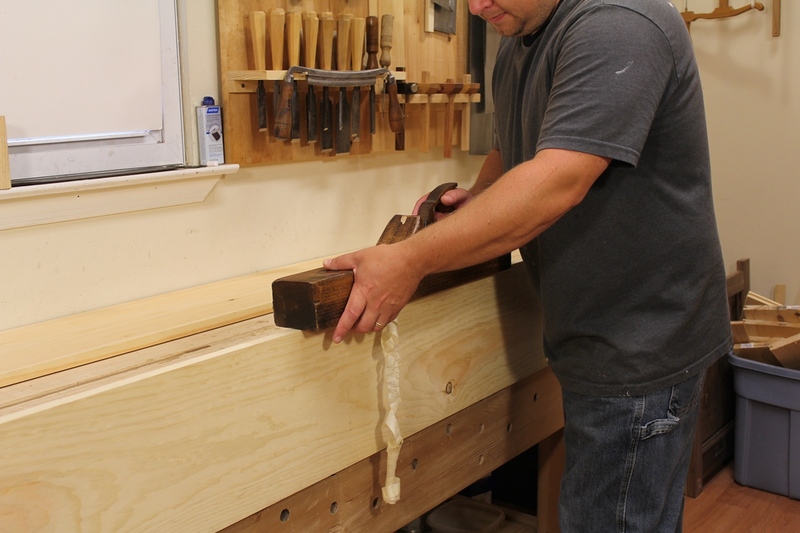 Any book or video can tell you the steps to making a mortise & tenon. But reading a book or watching a video won’t give you the muscle memory to ensure the joint is cut accurately and goes together square. Don’t get me wrong, I’m not getting down on books and videos. On the contrary, I highly recommend reading everything you can and watching as many videos as you can stand, just not all at once. Woodworking books and videos, by themselves, are no better than reality TV. To get anything tangible out of them, we need to put the information in them to use. So instead of trying to consume volumes of information all at once, find just one or two tidbits at a time and then get out in the shop and use that information. When it comes to hand tools, the best teachers are the tools and the wood. Even if the only tools you have are a small handsaw, a chisel or two and a block plane, go use those tools and make something simple. Don’t let a perceived lack of tools or knowledge stop you from cutting wood. The tools and the wood will teach you far more than any book or video. Using hand tools is a very tactile way of working with the wood. It’s all about feel and feedback from the tools and the material. When you use planes and chisels and hand saws, you feel and hear things that let you know what is going on. I’m not talking about some kind of spiritual, zen thing. I’m talking about real, tangible results. If you pay attention to what is happening, simply using your tools will teach you more than any book or video alone. For example, when I’m jointing a board’s edge straight and square, I can feel and hear when I’m done, even before I confirm my results with a square and straight edge. It’s the tool (the long jointer plane in this case) that makes this possible. With a properly set up long jointer plane, jointing an edge straight by feel and sound is something you can do the very first time you pick up the plane. If you pay attention to what is happening, you begin to understand how you can control the results with your actions and the tool you choose. Feeling that an edge is square takes a little more time and muscle memory to master, but it only comes with practice. You won’t get there by reading and watching videos. You need to work with the wood and let it teach you. I equate it to playing an instrument. For years, I’ve been telling myself I was going to pick up my guitars more. I’ve got a solid base in theory and can tell you the notes in a lot of the chords from my days playing other instruments through high school. But I’ve never really dedicated the time to sit down with the guitar in my hands and learn to play it well. So I can strum a few chords, but I really wouldn’t consider myself a guitar player. I could never play along with other real players. Just like playing the guitar, working wood with hand tools requires some time and dedication to learn to do well. But once you get it, it’s a skill that pays endless dividends and will be with you the rest of your life. So by all means, read, watch, and study as much as possible. But most importantly, get out in the shop, pick up your tools, and do something with them. Posted in Random Thoughts and tagged beginner.